Over the past few months I have read a lot of subscription box blogs. 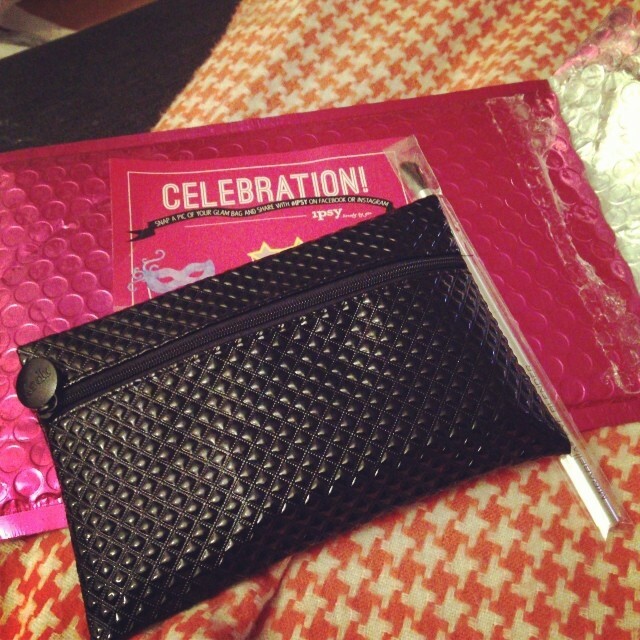 A lot of ladies out there are reviewing the Ipsy Glam Bag. A monthly beauty box subscription program that gives you 4 to 5 deluxe samples along with full-sized products in a reusable makeup bag. I was wowed by the quality brands and diversity of the products. I knew that I needed to have an Ipsy Glam Bag in my life. With Ipsy you sign up by completing the Ipsy Me quiz and give all of your shipping/billing information. The Ipsy Match quiz asks questions about your beauty routine, life style, eye and hair color to create a bag that suits YOU. It took me about 10 minutes to complete the quiz, at the time I was waitlisted. Bummer! So I waited and waited, and waited just a bit more until I got an email saying “You are off the waitlist! HOORAY! !” Sweet, I was off the waitlist, but the bags had all ready left the loading dock and I had to wait until December. Bummer! So I waited just a few weeks until I got a shipping confirmation email. Insert happy dace—–>here<——-! I had seen a few sneak peeks online and was totally excited for the products. Soon I got an email telling me I could check out my bag in my "glam room." It totally knocked my socks off and the stocking began. I stocked the crap out of my Ipsy bag until it was in my mail box. Surprisingly the bag didn't take long to arrive and I eagerly ripped open the bright pink envelope to revel my little bag of goodies! POP Beauty – Brighten Up Your Life Eyeshadow Trio in “Smokin Hot”: Complements all eye colors and the hues blend smoothly onto the lid, adding a veil of silky luster that will outlive the day or night! ————————————–> I was hoping to get the Naturally Bare Trio, however I got the smoking hot which are colors I normally would not wear. However life is all about discovery and I am going to give this color trio a shot on New Years Eve or a formal event. I don’t normally wear dark colors for day, I stick to nudes and light pinks. Be a Bombshell ~ the one stick in sunset: An all-in-one multiple stick with a smooth texture. Apply to eyelids, cheeks or lips for the perfect pop of color anywhere! ————————————> LOVE! 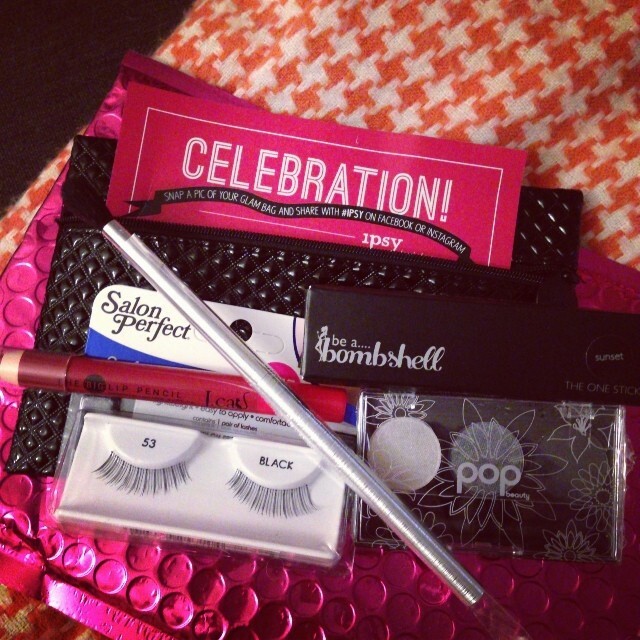 I was wishing an hoping since the sneak peek product reveal that my bag would have the Be A Bombshell one stick in it. I was super excited when I opened my bag and found it in the bottom. I love it, the color is perfect and it does not dry out my lips. I have yet to try it on my cheeks, thou I have no doubt the hue will compliment my skin tone nicely. Mirabella Eyeshadow Blender Brush: Fuses eyeshadow to create a naturally sculpted eye. Tapered domed shape provides flawless and easy application. ———————————–> I thought it was such a nice touch that Ipsy included a shadow brush in the bag to compliment the eyeshadow trio. I was in need of a new shadow brush and this one totally fits the bill. Salon Perfect Strip Lashes: Allow every woman to have gorgeous lashes beyond what mascara can offer. ———————————> I am not going to lie…… these things are not going anywhere near my face. I have very thick lashes and will not b gluing anything to my eyeball, ever. J.Cat Beauty Lip Pencil in Red Rose: The Big Lip Pencil is a hydrating and vibrant lipstick as well as a sculpting lip liner. ——————————–> I used this pencil a few times over the weekend it is the perfect shade of red for my skin tone. It did not dry out my lips nor did it fade with the use of chapstick. I am very happy with my first glam bag and will try all of the products, well except for the fake lashes (those sort of scare me). It truly does live up to its name as the bag was filled with on trend products from well-known brands, I can’t wait for next month! Do you want an Ipsy Glam Bag of your very own? Well the, for $10 a month (shipping is free) you will receive a Glam Bag filled with deluxe samples and full-sized beauty products. Members can watch and play along with the stylists with the same products that they are using. If you want a bag of your very own or more information please visit http://www.ipsy.com/r/1w1i Trust me you will be glad you did!